EXCLUSIVELY REPRESENTING THE ART ESTATE OF WARREN DAVIS (1932-1974), Inadvertently WAS THE CATALYST TO MY PERSONAL CAREER AS AN ARTIST. THIS SECOND GENERATION ABSTRACT EXPRESSIONIST, WAS INFLUENCED BY FRIENDS WILLEM DEKOONING AND MARK ROTHKO. 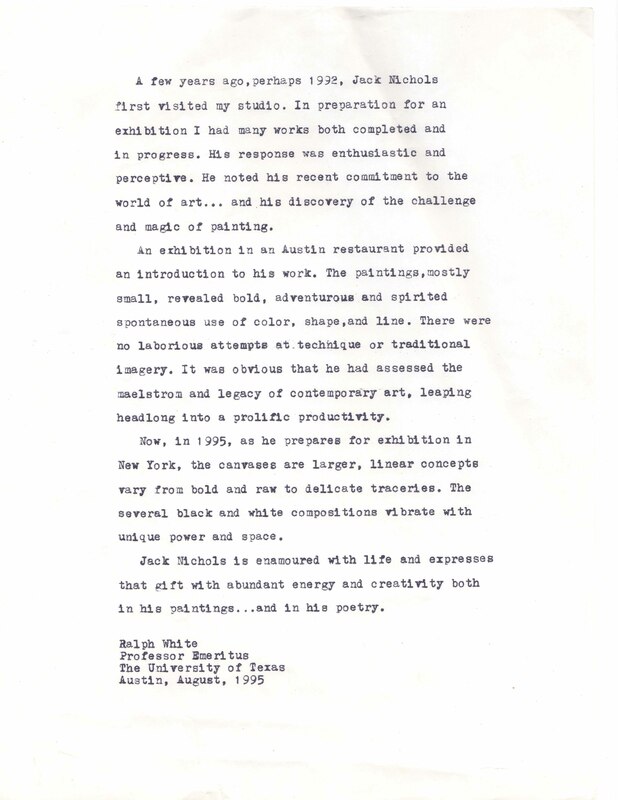 MY EXTENSIVE INVOLVEMENT WITH THE WARREN DAVIS ART ESTATE, Smithsonian's, AND many OTHER Museums Inspired A DEEP PASSION FOR artistry, as well as the metaphysical relationships to the finite world around us. THE PAINTINGS REVEALED BOLD, ADVENTUROUS, AND SPIRITED SPONTANEOUS USE OF COLOR, SHAPE, AND LINE. THERE WERE NO LABORIOUS ATTEMPTS AT TECHNIQUE OR TRADITIONAL IMAGERY. IT WAS OBVIOUS THAT HE HAD ASSESSED THE MAELSTROM AND LEGACY OF CONTEMPORARY ART, LEAPING HEADLONG INTO A PROLIFIC PRODUCTIVITY. A GREAT SHOW- INSPIRATIONAL AND ENDURING! STAY WITH IT! THE WORLD OF ART NEEDS YOU! In short, the paintings of Jack Nichols are icons of energy - the energy of the man himself, and by inference, the pervasive energy of the universe. Early on, Nichols - by nature bent, not by some cool rationality, found himself in the crossroads and gale of abstract expressionism. He sensed a resonance with the works of Pollock to Franz Kline, and others of the New York School and was moved to find ways to give visual form to his own aesthetic experience. NO TIMID STROKES HERE. WHIMSICAL IMAGINATIVE, EVEN MYSTERIOUS, HIS WORK EVOKES CURIOSITY IN THE VIEWER TO LOOK BEYOND AND SEEK INNER MEANING, AND THE ENERGY OF EXPLORATION TURNED INWARD CAN BE PERSONALLY REVEALING OF BOTH ARTIST AND VIEWER. COLOR SELECTIONS ARE OUT OF THE ORDINARY, IMAGINATIVE AND CHALLENGING, SOMETIMES SOOTHING, USUALLY PROVOCATIVE. HIS STROKES ARE STRONG AND PUSHED WITH CONFIDENCE, FRENETIC, YET THE UNDERLYING FEEL IS THAT THE ARTIST KNOWS WHERE HE IS GOING. BOLD AND CHALLENGING, YET THE TEMPTATION TO DIVE IN AND GO EXPLORING IS ALWAYS THERE. there is a point where you are no longer observing an image of some thing, ”the painting becomes “the thing itself"
Now, with thirty-two years as a contemporary artist, original works only, hang in New York, London, Rome, Los Angeles, Washington DC, Houston, The Hamptons, Canada, Denver, Mexico City, Taos, and in collections of Dr. Paul Greengard, the 2000 Nobel Prize winner in Medicine, to Ron Brownstein, Dan Balz, Stanley Hirsch , and Ron Rettner collections in Washington DC & New York. Since arriving in Taos, New Mexico (2007), it’s been a nonstop experience and experiment of channeling the energies of nature and sometimes the super-nature. Like a collaboration of the raw and powerful elements (spirits) that make up the history of this high-altitude location. The transformation has been exciting, yielding unique and sometimes glorious new results. To the best of my knowledge, neither Pollock, DeKooning, Rothko, or any artist of the New York School ever painted using the techniques I work with. The methods I use did not exist when they were alive. an eclectic collaboration of techniques, energies past and present. Jack Nichols has been painting for thirty years. His technique can be described as nothing short of revolutionary and ultimately unique. "To the best of my knowledge, no one has ever applied the techniques I use," Nichols explains. "When you alter the ambient lighting in the room, the way the painting is viewed actually changes." Nichols describes himself as a synergist, combining the intrinsic beauty of color pigments with the fluidity and spontaneity of movement to create tremendous depths of field. "The paintings are not a picture of a thing, they are the thing itself." Nichols says, "You look at them collectively and wholly. Many years ago I was told that most of my audience had not even been born yet. I'm paintings these paintings into the future." "CREATING ANCESTRAL IMAGES FOR THE ANCESTORS... DOING WHAT I LOVE...TILL I COULD DO IT NO MORE"
SARAH Y RENTSCHLER GALLERY (ONE MAN SHOW) "FROM LINEAR TO CIRCULAR INCLUSIVE"
11' X 44 ' "ONE OF THE LARGEST STRETCHED CANVAS PAINTINGS IN THE WORLD"